MV distribution networks generally make use of uninsulated conductors strung between poles of varying materials. In many areas there is a risk of failure and consequent environmental damage with bare conductors. Insulated conductor systems for medium and high voltage have been developed to reduce risks and have proved to be successful in many areas. MV distribution lines are generally make use of roadside poles of lengths which provide ground clearance for conductors but which fall within contact distance of undergrowth and surrounding trees. Contact with fallen or wind-driven trees and vegetation not only provides a path to earth and between conductors, but can damage bare conductors and cause contact between conductors, resulting in arcing and sparking. Tree branches falling across wires provide a high resistance path which will not operate protection devices, but the low current can cause the fibres to ignite and fall down into the undergrowth, starting fires. Fig. 1: Spacer system pole mounting (Hendrix). Risk of failure of the overhead line due to contact with trees and other falling structures, high winds, passing traffic, etc. Risk of damage to property or the environment caused by fault conditions on the line. Typically bush or forest fires due to sparks or arcing, contact between lines, insulator breakdown, contact with trees or other conductive material, contact with live conductors. Harm to large birds, small animals or humans. Bush fires due to faults on overhead distribution routes are common in places such as Australia and California. Electrocution of large birds is a common occurrence on MV and HV routes in South Africa. Because of the larger number of MV routes, they constitute a greater problem for bird electrocution. To overcome these risks and improve the reliability and safety of MV distribution routes, overhead conductors provided with an insulating covering have been developed. The technology is known by the more common name of “covered conductors”, as their properties are different from what is conventionally known as insulated conductors. The use of covered conductors also allows for more compact assemblies and lower masts and poles and helps to minimise the environmental impact of transporting electricity by reducing reducing the visual intrusion of wires, poles and transmission towers. 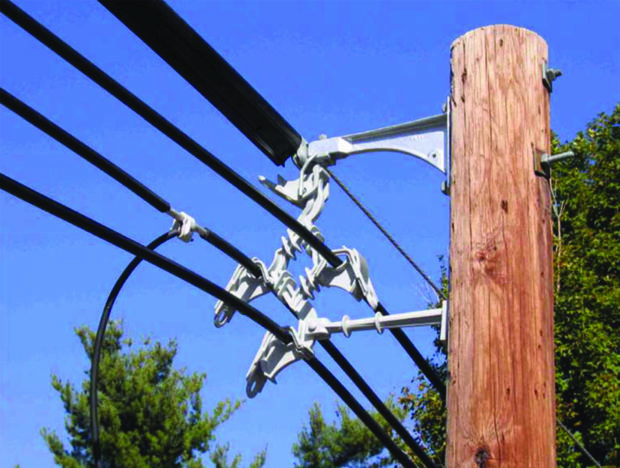 Covered conductor systems were developed in the 1970s and are used extensively in Europe, Australia, America and the Far East, but do not seem to have found much application in the South African system, although MV aerial bundled cable (ABC) is available locally and has been used on some routes . Usage is usually restricted to 33 kV for MV distribution but systems using single covered cable at 132 kV are also in use. European experience with covered conductors suggests that covered‐wire fault rates are about 75% less than bare‐wire fault rates. The covered single conductor forms the basis of all MV covered conductor systems. The covered conductor system, although not a touch-safe screened cable system, is designed to provide protection from initiation of flash-overs due to clashing of conductors, bird or animal incursions, and tree branches or debris which has blown or fallen on to the line, especially in conditions of severe weather and high pollution. Fig. 2: Spacer system spacer design. 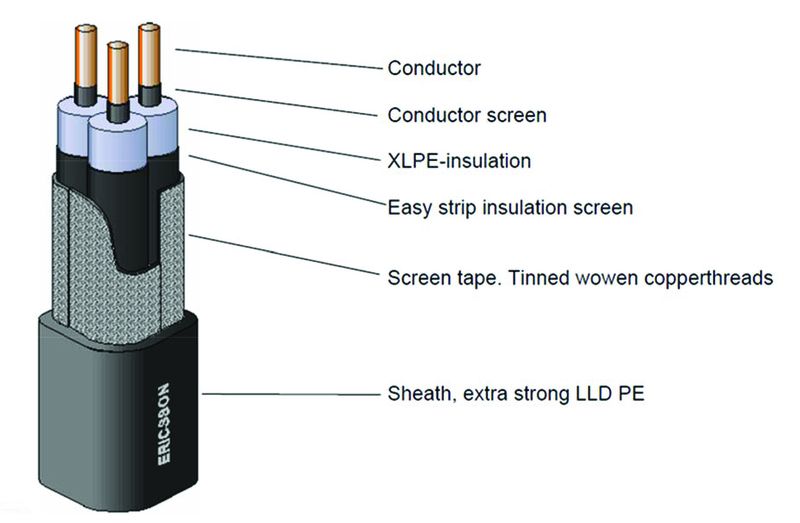 In other words, the covered conductor has lower insulating properties than “insulated cable” and is designed to withstand conditions other than those which would be encountered by insulated cables in electrical installations. Spacer cable systems (Hendrix technology) manufactured in the united states this consists of a group of covered conductors separated by spacers and supported by a “messenger”or catenary wire. Ericsson universal cable system- a three core cable designed for overhead or underground use. Commonly used in European and Nordic countries. MV aerial bundled cable (MV ABC) systems – a configuration adapted from the LV ABC technology that uses three insulated conductors plus an integrated insulated support cable. Fig. 3: Ericsson universal cable construction (Ericsson). CC consists of single core conductors with a variety of insulation layers and outer sheath coverings. The conductors are generally of aluminium, aluminium alloy or aluminium core steel reinforced construction (ACSR). The high density outer layer resists abrasion, electrical tracking and UV degradation. The insulation materials are polyethylene, XLPE, and EPR. 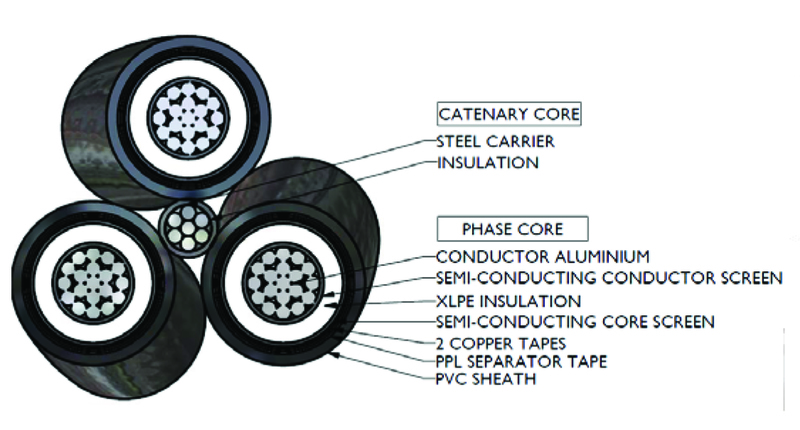 XLPE and HDPE are the most commonly used sheath materials for covered conductors. XLPE is preferred to HDPE since it has about twenty times the environmental stress crack resistance and about five times the impact and tensile strength of HDPE insulation. Single sheath conductors commonly use uncompacted aluminium alloy wires with an XLPE or HDPE sheath. The thinner sheaths reduce the overall diameter and thus, the wind resistance, leading to lower vibration levels and lower snow loads . The impulse strength of a single layer of XLPE sheathed CC is around 115 kV . However, the electrical stresses caused by trees on the line or conductors on the cross-arm can erode the sheath in periods from months to minutes depending on the system voltage. Surface voltage stresses are greater with porcelain insulators rather than polymeric insulators due to the greater difference in the dielectric constants of the porcelain (three times that of polymeric insulators) and the XLPE sheath. Surface tracking of XLPE sheathed conductor also occurs in coastal environments, especially if the carbon black content is around 3% (which is the case in many CCs). This effect can be reduced by the use of polymeric insulators or switching to an HDPE sheathed conductor which contains substantially less carbon black. CCs can have three, five or seven sheath layers problems. Generally uncompacted, the core has a larger overall diameter than the equivalent compacted versions. A mastic EVA compound provides moisture penetration resistance. It is also available in partially compacted form. Fig.2 shows a three layer CC. Fig. 4: MV ABC cable (CBI Electric African cables). The three layers are basically a semi-conducting screen close to the metal conductor to equalise out the electric field, an insulating polyethylene sheath and finally a hard abrasion-resistant outside layer of HDPE. The semi-conducting sheath is particularly useful on an uncompacted conductor as it equalises out the electric field and reduces the local voltage stress across the sheath when in contact with another object (tree, crossarm etc.). This allows the conductor to last for considerable lengths of time when, for instance, it is brought into contact with an earthed object. Further layers are added to improve the screening and electric field equalisation. In this configuration an additional semiconductive screen layer is added on the outside of the insulation layer, which further serves to equalise the electric field in the cable and reduce high electric stress points. In this configuration an additional metallic screen , which may consist of tape or wire wrap is added on the outside of the insulation layer. Copper is generally used for this purpose. The metal screen may also replace the semiconductive screen completely. Field experience has shown that the semiconductive screen easily becomes damaged due to incorrect handling during installation or abrasion during operation, and this results in damage to the cable, causing arcing and bush fires. The metallic screen increases the diameter and weight of the cable, but the improved performance outweighs the disadvantage . Covered wires of the types above may be used as a direct replacement for open wires with the same design and construction methods with the exception that reduced clearances and conductor spacing are applicable. CC cannot be used with porcelain insulators because the difference in dielectric constants between porcelain and polyethylene will eventually lead to electrical erosion of the polyethylene cable insulation. In normal overhead line design the phase-to-phase clearance at the mast or pole is determined by the need to maintain an acceptable level of mid-span clearance under specified conditions. This means that the phase-to-phase clearance at the towers of a conventional overhead line is significantly over-dimensioned from a purely electrical point of view. With covered conductors the situation is totally different . Fig. 5: Reliability of bare wire and CC systems . Another difference is in arcing behaviour. When flashover occurs between the phases of a normal overhead line the arc starts to move immediately, but if the flashover and puncture occurs with covered conductors the arc will remain in the extinction point and is very likely to melt the conductors. This must be prevented and effective shielding against lightning strikes must be provided. It has been assumed that flashover may happen at the tower and arcing horns are needed. The live end arcing horns must also have galvanic contact with the conductor. 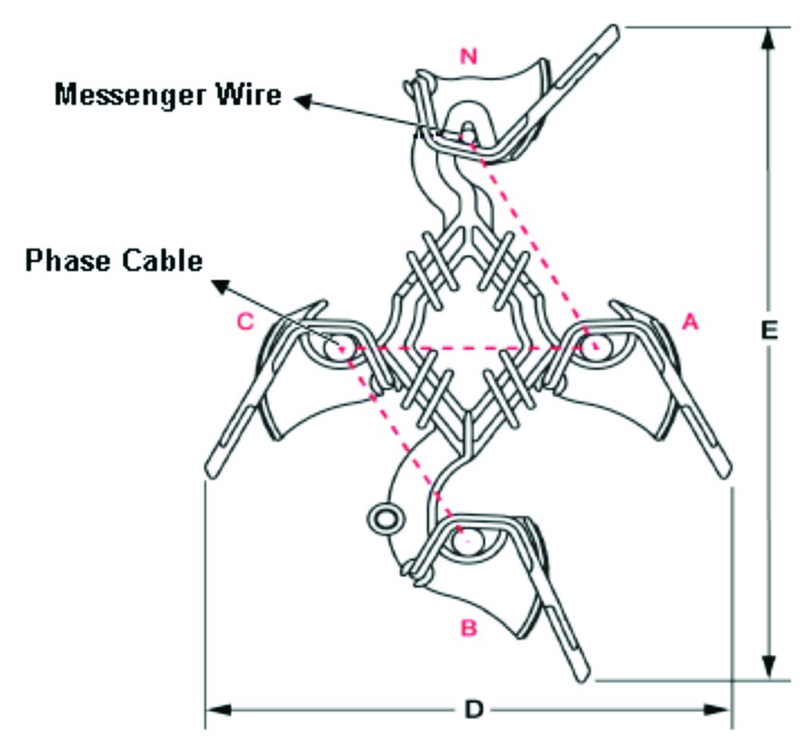 Spacer cable systems are essentially three CC phases in a polymeric support cradle supported by a “messenger” or catenary cable. The system, as manufactured by Hendrix, is used extensively the United States and has been tested for use in several other countries. The system is usually used for MV routes up to 33 kV but has been successfully extended to 69 kV routes. The conductor used is the triple sheathed CC version discussed earlier. The system is used widely in the USA, South America and parts of Canada and is being marketed in Europe. Overall it is used in 60 countries. Spacer cable is a pre-engineered electrical distribution system designed for high reliability, and improved right-of-way flexibility. The conductors are covered with three layers of polymer designed to allow intermittent contact with ground points (tree branches, etc.) without causing an outage or nuisance tripping. The conductor is supported by a high strength messenger (catenary) wire which provides mechanical support, a system neutral, and acts as a shield wire against lightning. The conductors are hung loosely beneath the messenger and supported by “spacers”, which results in virtually no tension on the conductors. The insulating properties of the covering allows the messenger and the conductors to be bundled into a compact area. The messenger wire is used as the earth of the system because of its high strength and high conductivity. This is a self supporting three-core cable system designed for a variety of different applications, including overhead routes. The cable consists of three metallic screened CCs enclosed in common protective sheath of linear low density Polyethylene (LLDPE) as shown in Fig. 5. The cable is available in 12, 24 and 36 kV versions, with a maximum ampacity of 160 A for 12 and 36 kV systems and 200 A for 24 kV systems . The cable is used extensively in Nordic countries for overhead MV distribution. MV aerial bundled cable consists of three CCs bundled together with a support wire or catenary. At medium voltages, typically <11 kV, it is becoming general practice in some countries to use the ABC option instead of open wires. This allows the adoption of shorter poles, and the result is generally considered to be visually less intrusive. The type of CC used may be any of the varieties previously discussed, and the choice will depend on the application. In South Africa the applicable standard is SANS 1713 “Electric cables – medium-voltage aerial bundled conductors for voltages from 3,8/6,6 kV to 19/33 kV”. The cable may be of the three core plus catenary or four core self-supporting type. The conductor may be aluminium or copper. The conductor may be shielded or unshielded. Ampacity of a typical product ranges from 150 to 400 A across the 6,6 to 33 kV range. HV ABC is used extensively in some countries such as Australia, where bare overhead wires pose a high risk of the ignition of bushfires, and extensive experience in the use of HV ABC has been gained. There are a few instances of MV ABC use in South Africa. 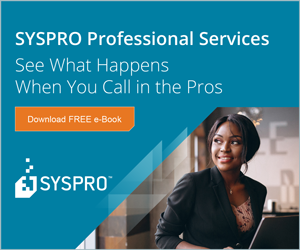 The economics of CC use depends on the inspection and maintenance procedures of the utility and the cost benefit put on safety, reliability and fault reduction . Some utilities state that the lifetime costs are lower due to greater reliability and reduction in fault levels. Others state that their line patrols etc. still need to be carried out and so no reduction in lifetime costs is apparent. CC is, however, accepted world-wide as having a major impact on safety levels for both human and wildlife though some utilities state that this alone does not justify the higher initial capital cost. 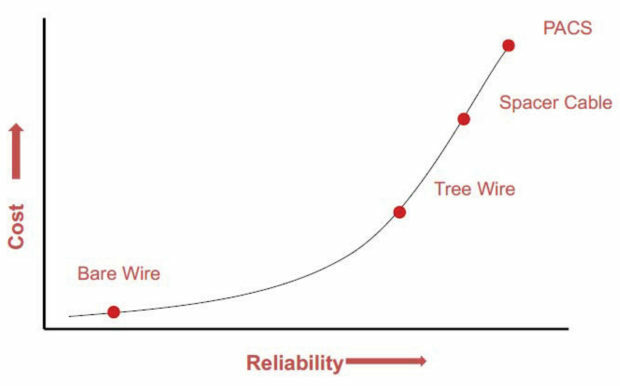 The problem of detecting a downed conductor is still the subject of research but most utilities consider that the use of SEF and recloser strategies is sufficient to meet safety requirements and that the performance of downed CC detection is very little different than that of detection of a downed bare wire conductor. Installation costs may be higher with CC lines due to the increased care level necessary so as not to damage the conductor. The use of CC can add 15 to 20% to the overall cost compared with bare wire . The cross-arm is generally smaller and lighter and more easily handled. 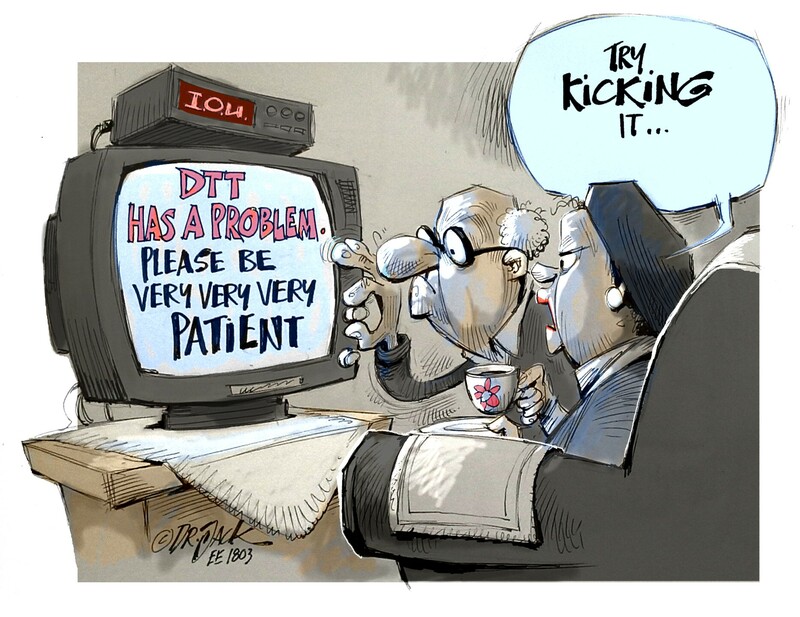 It is therefore cheaper to install and may have additional long-term benefits for linesmen. Poles are generally heavier and taller for CC lines due to the increased weight and sag. However, the incremental cost of the extra height is quite small in terms of overall installation costs and the use of stronger poles may benefit increased security. Poletop hardware may be slightly cheaper with CC lines due to the increased use of fittings which are easier and cheaper to install than bare wire fittings. Lightning protection is an additional cost for CC lines, but this may be balanced partially by fewer faults due to lightning. The gains from reduced weather outages (no clashing, fewer problems with blown debris and trees), improved third-party safety, better pole-top working conditions (with shorter cross-arms), reduced vandalism and being more environmentally friendly to wildlife are very difficult to quantify. J Wareing: “Covered conductor systems for distribution” EA Technology, Report No. 5925, Project No. 70580, December 2005. Powerline January 2017: Special section on covered conductors. R Kruger and K Kraft: “Proactive bird mortality mitigation in distribution”, Eskom standard ENV16-R223. Ericsson: “Universal cable handbook”, Ericsson, 20091201 23/28701-FGC101683 Rev F.
 CBI African cables MV ABC catalogue.